There were 15 mileposts along the canal towpath, but unfortunately three have been missing for some years. 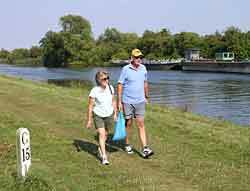 The Canal Users' Forum arranged for the replacement of these three, and this study provides background information for the project and reports the outcome. Most of the mileposts (known locally as milepegs) stand about three feet high on the hedge side of the towpath and extend about two feet into the ground. The letters and numbers, recessed into each post, are about six inches high, and they indicate distances in miles from Gloucester lock and from the original tidal basin at Sharpness. The mileposts were probably not original features as they are not mentioned in the very detailed accounts submitted by Hugh McIntosh, the contractor who completed the construction of the canal in the 1820s. The vast majority of vessels using the canal travelled the full length, and so having a measure of distance was not important. Some mileposts, but not all, are shown on the meticulous plans of the canal prepared c1840. This suggests that the posts were being installed at the same time as the survey. 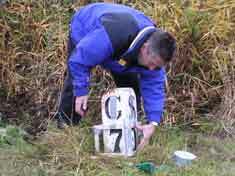 An entry in a maintenance diary during the winter of 1861-62 uses the position of a milepost to locate where the bank gang started lopping willow trees. Subsequent entries refer to mileposts when noting where dredging operations started or stopped. 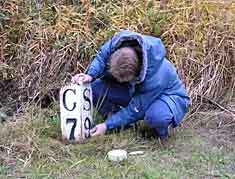 It seems likely, therefore, that the mileposts were installed to help pin-point places where maintenance work was needed or had been done. In 1892, the same diary records that John Apperley of Hardwicke was paid 15d for painting the 15 mileposts white and 1d for each of the 72 letters and figures on the same. The 1 mile post, about 630 yards north of Hempsted Bridge, had slipped into the canal as the bank there collapsed due to erosion from the wash of passing vessels. 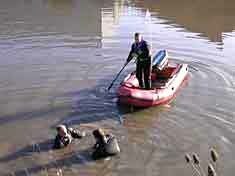 For the recovery operation, see below. A replacement was installed in 2004. The 4 mile post, about 200 yards north of Sellars Bridge, was obscured by a willow tree, and it was moved to a more open position in 2004. The 7 mile post, about 1230 yards below Parkend Bridge, only protrudes 1ft above the ground - presumably because the bank has subsided over the years, requiring additional material to be added to make up the level. 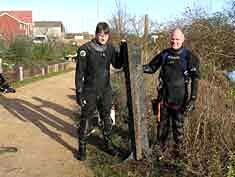 The 8 mile post, just below the Junction, has been moved to a position between the towpath and the canal. 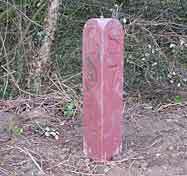 The 9 mile post, about 200 yards below Saul Lodge, was missing, and a replacement was installed in 2004. 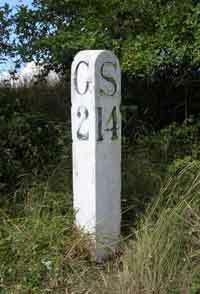 The 11 mile post, between the Cambridge Arms Bridge and the bridgeman's house, was missing, and a replacement was installed in 2004. The 15 mile post is shown in the adjoining photograph. Sources: Glos RO D2460 Hugh McIntosh's accounts; BW Archives 547-559.90 survey maps; Glos RO D2460 Maintenance Book. 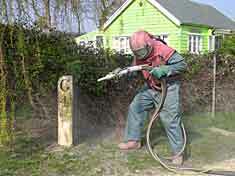 In October 2003, an order was placed with the Cannop Foundry of Cinderford to cast three replacement mileposts. To make the replacements appear authentic, David Hall and a colleague from the foundry visited two surviving mileposts and took impressions of the letters and numbers that would be needed to make the appropriate patterns for the castings. 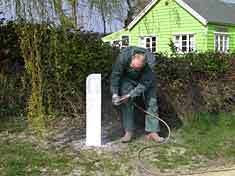 In early March 2004, British Waterways installed the three replacement mileposts cast by the Cannop Foundry. Later in March, a contractor blasted and repainted all of the mileposts. 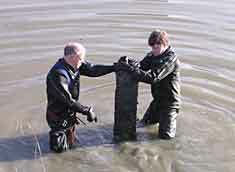 On 30 November 2003, a team from Gloster Divers carried out an underwater search one mile from Gloucester and found a milepost that had slipped into the canal many years ago when the bank was eroded by the wash from passing vessels. After much effort, they managed to tie ropes around the heavy cast-iron post and drag it up on to the canal bank, from where it was taken to the National Waterways Museum in Gloucester.